Just wanted to put this out there and get my next ball rolling I have recently decided that since Mechadrome and Blackwater Gulch both use mostly the same rules, and I think those rules could work for just about any genre, I’ve decided to change things up a bit and am now writing out the rules for the Gangfight Skirmish Game System. This will contain all of the game mechanics and character creation rules, along with skill & equipment lists for a variety of settings.. fantasy, WWII, and more. The goal is to have a flexible system that’s easy to adapt for a almost any game genre or time period. Then, separately, what I plan to do is have World Books that will be for each game world, so there will be a separate Mechadrome book and eventual Blackwater Gulch book with all of the background, special abilities, equipment, gang bios and everything else you need to play. The rules will be the same, it’s more like the presentation that will change. 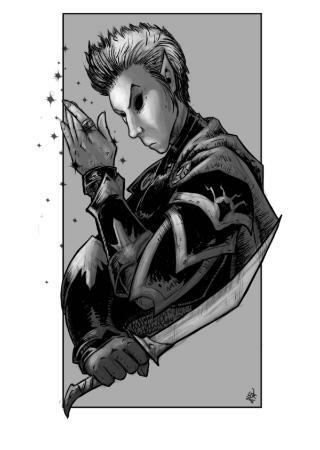 I’d also like to do themed campaign books for each game, where each will have a small story based on 2 gangs and include some special scenarios to play, and also introduce some new characters, but those would come much later. Campaign rules will also be more integrated, but you’ll still have the option of using cards for premade characters like now. I’m hoping I can get the rules to a point where folks are using them for their favorite games and models, and even allow other companies to use them for their own lines of minis and game worlds if they want. Open source I guess? I think we have a pretty easy and fun set of rules going so why not make it more flexible and open it up to other settings as well. So that being said, are there any settings you would really love to see included with the core rules? I’d like to have maybe 5 or 6 to choose from in addition to BWG and Mechadrome that will come in separate books. I’ll be doing BWG much later though since those new rules just came out.. and it will take a while to put the new book together anyway and balance out the different settings. If all goes well, I should have the core rules worked out in the next week or 2, then I'll share em when they're ready Working out the guts of the different settings will take a bit longer though. I personally quite like this idea and then you'd have people playing it in both settings (the wild west / weird west setting has never interested me, whereas mech combat definitely does!). The only thing I'm not sure about is that it seems like you'd need some different mechanics for mechs as opposed to unarmored humans, such as the ability to lose an arm and keep functioning. So, perhaps rules that only apply to vehicles versus infantry models. Overall, streamlining it this way is very cool, I think and lets you have the possibility to expand and add things, and easily plug them into the existing system that you'll create. The hard thing with small skirmish rulesets is always adoption, so I think if you're able to box it all together in an easy-to-play, almost board game format for each setting, that would be excellent for getting folks to try it out. Obviously, without a board but just meaning everything else needed to play. I'm putting together rules for vehicles too, even though in a 10-or-so model gang the emphasis should be on people and making each one a unique hero (or minion). So for the Mechs for example, the way those rules will work is the Mech you're driving will work more or less like a ginormous suit of armor, so it increase your character's HP and Defense stats, the current Mechadrome mechs all have a lot more health than a guy on foot in BWG for example. So the Mech makes you harder to kill if you're fighting against a guy with a laser pistol, but Mechs will all carry heavy weapons that will punch through that extra armor a lot easier. One other rule I was going to be adding to Mechadrome for drones and rookie squads is 2 or more men on foot can concentrate their fire for a strength bonus to help punch through thick armor too. But the drawback is anyone that adds their guns to your attack will lose their own activation. So they basically all shoot like a squad would, or you can still work solo too. I don't want to focus on squads too much though, I want to keep it simple where you're playing a game that's more like 2 squads fighting each other rather than a small army. And also, those same rules could apply to a tank if you were playing a WWII setting or whatever also. The different genres will all have the same rules, and weapons will all more or less have the same stats, just different fluffy names. So each different game setting should be balanced just fine, in theory. It sounds very feasible; there was a set of rules published a while ago, "Big Battles For Little Hands" http://www.amazon.com/Big-Battles-For-Little-Hands/dp/188958410X in the "Blood and Swash Rules for Skirmishes", which supported a mixed genre, with minimal modification, including pirate fights, wild west bar-room brawls, and commando raids.... worth looking into if you can, but you're on the right track with this concept. Cool, yeah I figured it’s not a new idea, but I wanted to make my own I know there’s been a few generic RPG rules too like GURPS. I’m planning to set up print on demand books for people that really want a book, but I’d like to have it be all free PDFs and possibly something like a wiki rules lookup site.. and if I can afford a programmer to do it I’d love to be able to have an online gang builder where you can build and equip your guys and it will spit out a nice looking PDF gang roster for you.. and you can save your gangs online or set up campaigns/leagues with your friends where it keeps track of your wins and losses and stuff like that. I want to keep the rules as free as possible though, and work on as much of it as I can all by myself so I can save more of my budget for new sculpts. I think maybe what I’ll do is start off with 1 generic setting for a D&D style fantasy world that will be included in the core book, since that will better illustrate how you can have different races and armor and powers and stuff. And then have the Mechadrome and Blackwater Gulch world books separate since they will have a lot more content. Not sure if you've ever played any of the stuff from Two Hour Wargames, but Ed does somewhat the same thing: One general combat system that he uses for multiple settings. Coincidentally, Ed just released a Weird West game ('High Moon - Dead Reckoning') that is an update to Six Gun Sound with witches & vampires & werewolves, and also has a mecha combat game ('5150 No Quarter'). As well as a pretty fun dungeon crawler ('2-Hour Dungeon Crawl). Your system is a good base for this. I used it for adding aliens recently with little difficulty. Its just a matter of balancing all the skills and gear. Yeah I'm hoping the new rules will make special games like that a lot easier, with universal skills and weapon stats. Also going to have rules for ogre and giant sized models, who get extra attribute and health points, but also have a higher XP so they cost more fame. 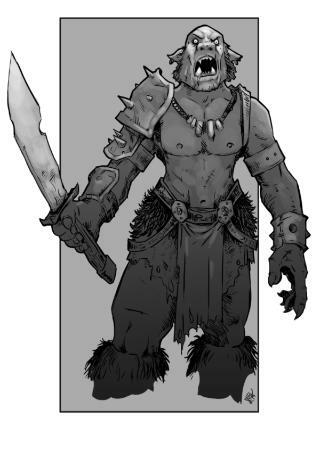 So like you could have a small gang of 3 or 4 ogre types costing about the same as a gang of 5 or 6 regular guys.. and those rules could work for big fantasy monsters, or aliens or whatever. It's basically the rules I was planning for Sasquatch who was gonna be ogre sized, and the Jersey Devil who was gonna be giant sized. But it'll be quite a while till I can get around to making those minis. So here’s some of the tweaks I’m working out to cover some of the things like for other races and big models. Shields or weapons that can parry give you +1 DP. I thought about also having really large shields giving +2 DP but I’m afraid that might start to unbalance things so I’ll have to test it. A Hero with a giant shield and in heavy cover could have a DP of 7, which is kinda crazy. Armor on the other hand does not give you any DP, instead it adds to your HP. Light armor +1 (leather), medium armor +2 (chainmail-ish) and heavy armor +3 (plate armor). BWG isn’t really going to have any armor, but it will be in Mechadrome and the fantasy rules. Also, I’m going to be changing the rules for Super Strength, if you are attacking with a strength of 7 or higher, the target will have -1 DP. Plus Heavy Weapons will also have a -1 DP, but those will mostly just be in Mechadrome. So, a heavy weapon that can be buffed up to str 7 or higher would be -2. But, a heavy weapon can only be used once per activation. I haven’t decided yet but I’m thinking of changing the rules for 1 handed weapons. In the new rules your stamina = how many actions you get, so if you have a stamina of 4 you could stand still and shoot 4 times for example. So what I’m thinking of doing is if you have 2 1-handed weapons, you’ll just get a +1 to your attack roll. For fantasy races, instead of special powers I’m going to have them just get a certain attribute bonus. Humans are jacks of all trades, so they can add +1 to any attribute. Elves are wise and old so they would get +1 Intellect. 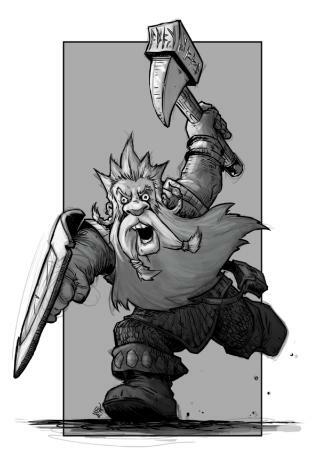 A halfling is quick and nimble so they get +1 quickness. Orcs are big and tough and would get +1 str. Dwarves (dwarfs?) drink lots of beer, so they get +1 stamina. I’m also going to do away with professions, sort of. Instead of just choosing the profession you want, their abilities will become skills and you can pick the skills you want up to your intellect level. So, in BWG, you could be a Wrassling-Gunslinging-Gambling-Doctor if you want, but you probably wouldn’t have room for any other skills that might be handy like Run & Gun or Duck & Cover. So, I’ve got the core rules more or less done. It’s mostly just a copy & paste from Blackwater Gulch with a few tweaks. So I got it all together a lot faster than I thought. But, I’m kind of torn with a few things.. I was originally planning to include lists of universal skills and equipment, but I just decided it will be better to list all of that stuff in each setting’s book. I think it will be more fluffy that way. So I just need to do some cleanup then I’ll post the basic core rules first to see if anyone has any ideas to add, then start building up the sample fantasy rules. I’m also still waiting for my Dungeon Saga stuff to show up, I don’t really have any other fantasy minis to play with other than a few random warhammer models, so I don’t think I’ll start playtesting till I can get ahold of them. Another change I’ve been thinking of doing with the core rules is having a campaign system built right in. 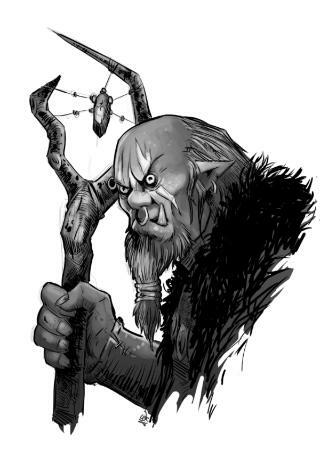 I like the idea of your characters starting out wimpy and getting tougher over time, like games like Mordheim, but I kind of worry that not everyone has a solid group to play with for a campaign system to really work. I’d like people to be able to easily play balanced pickup games too with standard characters. So what I’m planning on now is something more along the lines of an escalation league. For a regular game, you just set your gang’s Fame level to a size you and your friends are comfortable with, maybe 400 points, and when you build your gang you can add as many characters you want and equip them how you want, up to that level. In a campaign, everyone would start a gang with something like 200 or 250 points. After each game, your gang gets more famous and you earn more points to spend adding new characters, or adding new equipment. If you have enough points, you can add a whole new guy, or just promote one of your minions to a gang member, or a gang member to a hero for less points. So the only real difference between campaign games and regular 1-off games is points size, and campaign games would still have the aftergame phase where your out of action guys could have injuries or be killed. Been chatting about this again today and I think we have the format and game plan nailed down now. 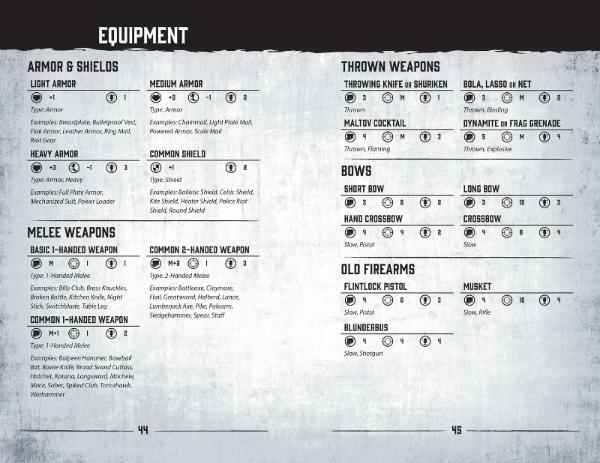 We'll have the core book with everything you need to play, with appendixes in the back that have universal skills that can work for any setting, plus different weapon & equipment lists for a variety of different genres. The stats will all be similar, so it will be easy to mix genres too, like if you wanted to have cowboys fighting against martians. Next we'll produce a separate book for our upcoming fantasy game world, and that will include unique races, skills, spells and equipment and all of the fluff and background you'd expect. I wanted to do Fantasy first because it will use more of the core rules, like there's no real armor to wear in the Blackwater Gulch, or magic spells. And the Fantasy genre has more options for having special rules for lots of different races. I don't plan to do any fantasy miniatures though, so these rules will be for use with any minis you have. We may look into doing some special characters though later on and see how it goes, but the focus will be on building a rich world and a fun & balanced system. The next 2 books would be Blackwater Gulch and Mechadrome. Not sure which will come first, probably BWG. Mechadome will also get updated to include regular men on foot rather than being just mechs, it will be like our official sci fi ruleset building upon the more generic sci fi equipment rules that will be in the core book. No idea when this will be ready to go though, too early to tell. I would guess at something like a playtest version around winter time, and the core book + fantasy book around summertime maybe. And then the 2nd book would probably come a few months later maybe around this time next year. Little update. We have the core rules just about finished now. The only thing left is to add the chapters for each setting. These will mostly just be include lists of classes/professions, special skills and weapon lists. They'll be a bit generic but designed to let you play in a variety of different settings and also mix & match if you like. Right now I'm planning to include Medieval & Fantasy, WWII, Westerns, Pirates and Sci fi. Then separately we'll have bigger Gameworld Books that expand upon what's in the core rules. We'll be starting with a fantasy world being written by Jonathan Peace, and then we'll also have a Blackwater Gulch and Mechadrome book later on. I want to start with fantasy because it uses more of the special new rules along with having a much broader appeal, and this new world Jonathan is making is really cool, fantasy gangfights are gonna be lots of fun You'll see soon enough. Anyway... question I wanted to ask is... are there any other settings/genres you would like to see covered in the core rulebook? One thing about the new rules that was giving me some trouble at first was how to balance all of the weapons for each genre. They all worked fine in their own genres at first but not so well for crossover games, like if you wanted to have cowboys vs aliens or something similar. We still have the same weapon types & bonuses as Blackwater Gulch, such as shotguns doing +1 Strength at close range, but some bonuses are getting renamed to something that sounds more universal, and some weapon strengths are being adjusted. I’d rather handle higher-tech weapons scaling up in strength rather than coming up with all new special rules. Melee weapons work fine as is, it was more an issue for ranged weapons. So the plan now is to have slings and bows be strength 3, with ranges increasing based on rarity & the XP cost goes up for each. Crossbows will be strength 4, except for crossbow pistols that will be strength 3. Most guns will be strength 4-5, and some of the more futuristic weapons may go as high as 6. We’ve also got Heavy Weapons added in now. These are mostly just going to be found in sci fi rules. When attacking a vehicle like a Mech, they have Structure Points instead of Health Points. Getting hurt by a heavy weapon will remove 1 structure point, or 2 HP vs men on foot. What I did in my crossover game is to use the same stats as the cowboy weapons and give them a special effect in exchange for being one level higher. For example a heat ray was just a normal rifle, but it set you on fire. A disruptor pistol was a normal pistol that couldn't be healed. Your goal is a lot loftier than mine, but it allowed them to feel high tech without having crazy high stats on the weapons, and used a minimum of special rules. I did create a few special skills for the aliens. The one that worked best was teleport: It was just like running, but used INT and allowed you to pass through terrain. I could dig up the .pdfs of the cards if you're interested. Cool, I'd love to check em out. I was thinking of something similar though. Pretty much all of the weapons in each setting will have the same stats for balance, just some of the more high tech ones will have higher strength. I added a new thread with them attached. The core rules are just about finished. I’m going to start laying out the book soon and hope to have the first playtest version ready to go probably late this month or early next month. What we decided to do is not include different chapters for each genre since there are so many different genres out there to choose from. Instead we have universal skills and equipment and stuff like that, so it’s easy to pick the weapons you need for the setting you want to play, or even adapt them to use minis from other games like Warmachine or 40k. And then we’ll also have the separate books for different game worlds that we create that will include more unique stuff. I also have an all new news & info site that I'll be launching to support the new rules, skirmishgames.com. That's not built yet, but I plan to start on that later this month. Right now I still do have professions & classes, but I’ve been wondering if I should just drop them and have them all be skills instead? We’ve moved attribute bonuses to be based on races, and humans are jacks of all trades so they get +1 to any attribute of your choice. So since I was going to drop the attribute bonuses that professions get, I figured without that bonus they’re just skills anyway. I’ve been getting price quotes from a lot of different printers and I think I’d finally found one that I want to go with. I found it interesting that softcover books are only slightly cheaper than hardcover.. like there would just be a $3-5 difference to the retail price, so may as well just go with nice hardback books. I’m expecting each book to be in the $15-20 range for 80+ pages (compared to an 80 page GW codex that costs $40 :p), and $20-25 range for up to around 120 pages. So I decided rather than print on demand, since the prices are so good and only get better the more copies you print, I’m going to do a Kickstarter and try to get the nice hardback books printed. That will probably not be till late spring or summer though. And then, if it ends up not working out, we still have Wargame Vault to fall back on if the campaign doesn’t fund. Not gonna do any minis though, the campaign will just be for the books. They will be full size 8.5x11” books rather than the half/digest size ones I’ve been doing till now, that was mostly to keep those print on demand costs down. I like the art! Is the idea, you'll use this to illustrate the rules system? I am just really looking forward to it! I'm hoping to have the first playtest version of the core rules ready to go in a couple of weeks. Also.. what I’m thinking of doing now is keeping the core rules in the same small format book I’ve always done. All of the rules I have minus the equipment lists comes out to a whole 30 pages. I don’t think it’s worth adding tons of filler to make a big hardback book, I’d rather spend my art budget making the gameworld books awesome. So I think it will be better to keep the core book short and sweet (and cheap), and have the Gameworld books be the nice hardback books with lots of great art, and have separate small Kickstarters for each gameworld book. That will also keep the funding goals lower. I’m getting a printing quote for the smaller format book for the rules, I’m hoping it will be cheap enough to offer that as a freebie item if you get the hardback book in the campaign if all goes well. And the rules will be free online as usual. I would just have to add that printing cost to the funding goal to cover it. Ah, now that I Really like - having the rules in a core book, and the gameworld books separate. Very nice and should make the core book extremely versatile. Yeah I think this way will work much better, keeping the rules simple and cheap. I reformatted the book last night to the 8.5x5.5 digest size, and it's at 43 pages. I think with the weapons, spells and diagrams added in it will probably be around 60 in the end. I don't know what would be better though... half sized book around 60 pages, or full sized book around 30 pages? I'm thinking half sized is good for transporting, but the hardback Gameworld books are all going to be full sized. So maybe the full size 8.5x11 rulebook would "match" better? It would just be less pages and probably have stitched/stapled binding. Guess I'll have to see what the printer quotes are like. Some other new ideas going on. 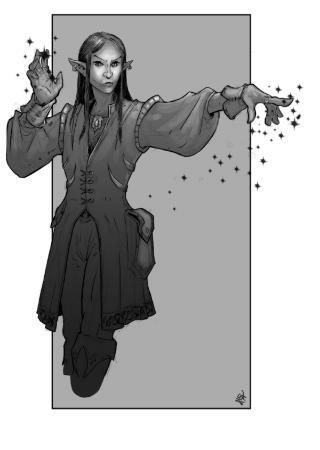 I decided to remove the lengthy character creation section I had in the core book, and instead what we’re going to do is have the stats and equipment and everything already set for a whole lot of different types of characters.. like an Elven Warrior or Martian Soldier. There will be a whole bunch for a few different genres. The stats will all be listed out kind of similar to your usual GW 40k codex, but I will also have printable card PDFs for folks that like that sort of thing too. I think by having premade character types it will be much easier to balance for pickup games. I’ll still have the custom character rules, but they will be more like an optional thing, along with weapon listings. I was thinking about maybe doing decks of printed cards, I like having nice and sturdy cards to play with. But I don’t know if that will work so well since if someone wants to have 3 or 4 of the same type of character then they will need multiple decks and end up with a bunch of other cards they never use. So I figured the printable PDFs would be better for that, and also allow me to keep adding all new character types later on. I’d also really love to be able to make an online gang builder site or tablet/phone app, but I don’t even know where to begin. I could handle the design part since that’s what I do for my day job, but no idea about the programming to make it work or how to find someone to do it. But I thought if I could find a company that can build that, I could figure out the costs and add it as a stretch goal in the Kickstarter maybe. 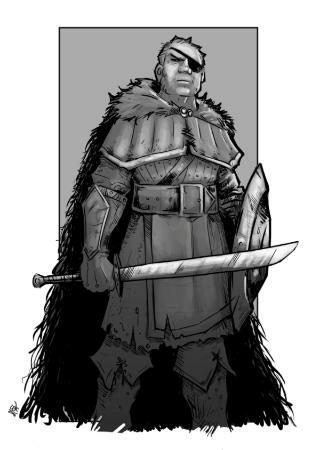 Got some more fantasy character artwork. Here’s a Halfling, High Elf and Dark Elf This will be it for a little while. Gonna wait till I get all of the background and fluff some time next month and then I’ll see what we need to do next. Still working on the rules in the meantime. I sat down at the computer today to start putting all my handwritten notes into some semblance of order. Shouldn't be much longer now till I have the first draft of the fantasy supplement written. Some more things I've decided to do with the overall format. I'm still working on the core book, I'm going to stop giving date or time estimates other than "soon" because I'm always wrong But it's coming along. So I'll have the playtest version done soon. This book will have everything you need to play any setting and create your own gang and characters from scratch. In the end the final version will be a free PDF and print-on-demand book on Wargame Vault. It will be kind of bare bones and functional, the goal is to make it as inexpensive as possible if you want the printed book. For the Gameworld books, rather than being a sourcebook that requires the small-ish core book, we'll be copying and pasting the full rules into each gameworld book.. those will be the nice hardback books with lots of art and photos and all. I decided that from a "usability" standpoint it will be a lot more convenient to have all of the rules and everything you need for each game world all in 1 book. 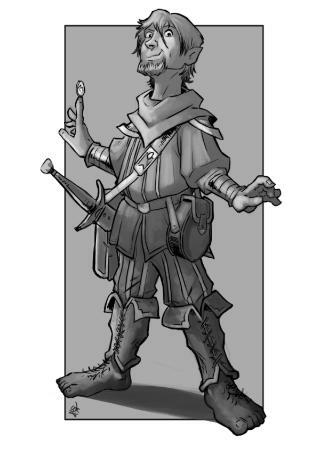 The gameworld books will also have tons of pre-made character types and special campaign rules and all that fun stuff. So the actual game rules will be the same in each book, but since they don't take up a whole lot of space I figured it would be better to just include them in each book so players don't have to feel like they need to carry around lots of different books. Plus, I think having everything in 1 book makes it more retail friendly. So you can use the free core rulebook for a "lite" version of each setting and get a taste of what the game is like, or get the bigger hardback books to have a full game with all the bells & whistles. I know i said I don't want to give dates anymore, but I'm hoping to do the Kickstarter for just the fantasy book, Lair of the Wurmqueen, around April or May. It will be a simple campaign just to fund the printing, with a couple of cool add-ons, but no miniatures or anything since the idea is I want players to feel free to use any miniatures they want.